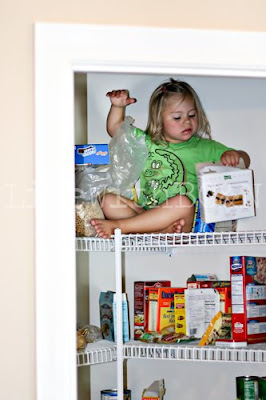 our perfectly imperfect life: Snacktime ..
... on the top shelf of the pantry? Seriously, who took my daughter and left me this monkey? I guess this is a good time to comment on the strength that Payton has. It boggles my mind, especially for a child that has Down syndrome. We can pretty much throw those stereotypes out the window! Whether she is scaling rock walls, pulling her entire body up on the monkey bars or simply scaling the pantry shelves ... the chick is strong! One day when Payton was at speech, there was another child in the therapy room doing PT. When we were getting ready to leave, the therapist commented on how she couldn't believe how muscular Payton's legs are. I really didn't know what to say, since I have never compared her leg muscles with that of another child. I mean really, who does that? But I do know she is a husky, strong little girl, so it makes sense ... and I guess it is good to know? That's all I got, folks. Haha. Holy crap! Did you watch her get up there or did you find her like that? Wow - that's just crazy! I can't believe she made it to the top by herself! OMG!!! Payton how did you get up there? monkey for sure!!! mayson could never do that. she just doesnt have the strength.. payton surpasses mayson in that department for sure! She and Elainah would get along so well. She is such a climber too! Oh too funny! I guess I should enjoy the fact that my 2 1/2 year old isn't mobile! I love that little monkey!!! She's so darn cute! I can't stand it! oh my gosh, that is amazing!!! and yes kind of weird about the leg muscle thing! Oh my goodness! OK, now I'm glad Kayla just likes to sit! Holy crap! I this what I have to look forward to? Goldie just learned to climb the ladder to the slide. And stand at the top while I run like a maniac before she loses her balance. I ask myself a lot why we still have PT. LOL! She is something else. Amazing climbing, but how scary! So glad the shelves held up! Oh my!!!! It's good catching up with your blog!! Looks like you're enjoying a wonderful vacation. I love this pic! Look at those climbing skills!